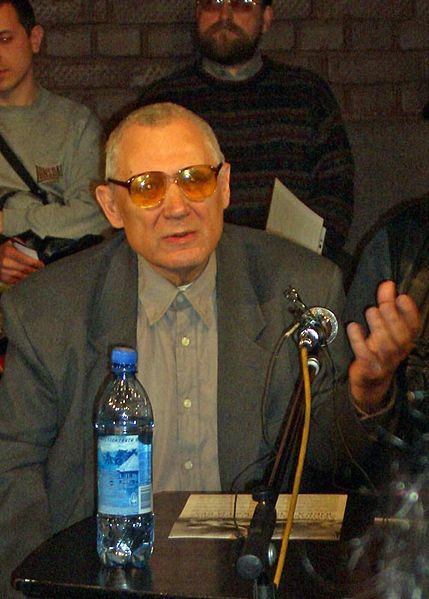 Yuri Mamleev’s literary works are available to the Western reader in numerous translations, his novels and short stories have been printed in French, German, Italian and other European languages. In English however there has only been a single book where several of his earlier short stories and parts of the Shatuny novel have been published. Today it’s hard to realize why this novel was not translated completely when printed in the USA in 1980. Yet the very fact that this first book appeared in the US had a significant impact on the writer’s further life. Thanks to it, Mamleev was admitted to American Pen-Club. Around that time in the late 70s he has worked at Cornell University of Ithaca, NY, teaching Russian literature to the American students. The Shatuny novel was written in the late 1960s against a backdrop of the formation and rise of creative intelligentsia, those years in the USSR were a period of a powerful outburst. Even back to Stalin’s time there were circles unifying artists, poets, spiritual and creative people and while almost no traces of those early efforts had remained, it had become a base for the further creative break-through which followed. During ‘Khruschev’s thaw’ from the early 60s and for the decade to follow a creative revolutionary phenomenon was accomplished, known today as the ‘Cultural Revolution’. Shatuny is no doubt the era’s landmark. This novel signifies the breakthrough of a consciousness concluded in the social-infernal sphere of being. Concealed feelings surface from the depths of the subconscious turning into formerly unthinkable patterns of a daily world, actualizing in totally unexpected and inconceivable manners. The author’s genius creates a world of personalities of immense depth, it’s often hard for us to realize the complexity and multiple facets of such a world. This is what makes the novel most interesting. It sets up a high metaphysical standard with modern literature and testifies that Art is eternal and indestructible. At the time of its writing the novel shocked readers. The search for the Truth, even the unreachable one, has been and still is the greatest motive for the development of humankind. The incomprehensibility of external Truth has been examined and justified by many serious researchers, in fact the dominating positivism does not require Truth today, for its Light threatens to eliminate the basic constructs of positivism. The internal aspect of the search has not been as profoundly examined, and each one’s idea of this is always strictly personal. In the novel the main philosophical position of the ‘metaphysical’ ones, which they themselves call the I-Metaphysics, offers new references for inner search. This is probably the only example in modern prose where the problem of metaphysical comprehension of reality is delivered in such a clear, interesting and original manner. There are various esoteric trends, some of which may lead somewhere; there is official and traditional science which may explain something; however, all these fail to properly answer the basic questions: Who we are? Why? How? The answers to these questions may hardly be given in ordinary terms, but it’s the author’s genius again that helps us grasp and sense the essence through the artistic image. Yuri Mamleev raises one important issue with Shatuny: could the human spirit overcome the doom and predetermination of material existence and go beyond its own limits? Is the search for stability really so important, or are there other priorities, other considerations? In the mysterious breath of the Abyss where all being appears to be dissolved, the ‘metaphysicals’ encounter an endless source of self-being. Self-realization is admitted to be the ultimate barest necessity. Everything besides it, the external, loses its significance, is devalued, dissolved. But what are the ways of attaining stability in our society? First of all one should be totally indifferent to spiritual life in general, get completely immersed into a philistine-life routine. This is not atheism, just indifference regarding anything spiritual, even life and immortality. Once it’s generally admitted, it may provide some stability. Mamleev spent many years of his life as an immigrant, both literally and metaphorically. Soviet reality was non-accepting of people like him and anything which exceeded the framework of common values was actively forced from the social conscious. Once the possibility to emigrate from the Soviet Union appeared, a stream of dissidents flowed to the West, who could not or did not wish to stay in Russia. Many of the cultural intelligentsia sought permanent residency abroad: the USA, Europe and Israel leaving behind everything, relatives, real estate, property. Leaving everything behind himself Mamleev left Russia in 1974. A brave new world awaited him, but many years of immigrant life followed. The possibility to return to the motherland only became available at the dawn of Perestroika and in early 90s he returned to Moscow. Russia had become a new country and everything had changed. What had been strictly banned was now promoted and so this novel was finally published in Russia in 1993. During the years of immigration and those that followed Mamleev’s works were printed extensively by various publishers. His novels Shatuny, The Wandering Time, The Ultimate Comedy, World and Laughter, The Other, as well as compilations of his short stories became widely known. A complete translation of his main philosophical treatise The Destiny of Being was recently published in France. This work is intimately connected to the period when Shatuny was created, it discloses the original, creative, metaphysical credo of the author in a systematic format. The upcoming edition translated as The Sublimes, is an exquisite opportunity to deliver one of Yuri Mamleev’s key novels to a broader public. It was made possible thanks to Luis de Miranda, publisher of Haute Culture Books, as well as the extensive work performed by the translator Marian Schwartz who undertook the complex endeavour. Mamleev himself greatly appreciates everyone who took part in the publication of this first full edition in English. Image: Yuri Mamleev, by Boleslav1, share-alike licence. Fascinating! I;d never heard of Mamleev but will be looking out for this book. Interesting stuff here … a metaphysical detective novel. I am not familiar with Mamleev, but this post on Interesting Literature intrigues me. This does give any number of fascinating concepts, not least of which being the extent to which some art and literature was obliterated in these ideological eras. Another is the concept that spirituality is achieved by ignoring it.